Granite, one of the world’s hardest materials, is a stone of choice for kitchen countertops, not only because it is gorgeous, but because it is resistant to most acids, very durable, and easy to maintain. Even so, granite is not impervious to damage. If your granite is dirty or dull-looking, scratched, etched, cracked, chipped or otherwise damaged, we can make it look brand new again! Much harder than marble, granite is a rugged and resilient stone that requires specialized knowledge and equipment to restore. Many restoration professionals won’t even touch it. But at Clean Sweep, we understand granite’s unyielding personality and have the right tools and techniques to get it looking its absolute best once more. Are your tiles uneven, creating a potential trip hazard as well as an eyesore? Or maybe you’d like your granite tiles more even with the grout lines, making it easier to clean and more monolithic in appearance? Whatever the need, Clean Sweep can help. We can grind away the excess stone (a process also known as lippage removal) to create a flat, level surface using state-of-the art diamond grinding technology. Then, once your granite surface is level, we can give it the finish you choose — honed (matte finish) or high-polish or somewhere in between. Hard as granite is, it still is not impervious to wear and tear. Dulling, scratches, and etching may eventually mar it’s stunning beauty. No worries. It doesn’t have to be replaced. We can hone your granite surfaces to eliminate these imperfections, resulting in a new granite surface free of damage. Then our expert technicians can achieve a honed or soft matte finish that is warm, inviting, and velvety smooth, or gorgeous, glass-like polish, or something in between. Our granite-specific equipment and techniques will bring your granite back to its original elegant state — or better. Granite cleaning processes vary based on the surface condition and type of dirt, oil or other contaminant being removed. Periodic professional deep cleaning services, utilizing highly-effective and stone-safe cleaning solutions help keep your granite surfaces looking their best. Clean Sweep is also happy to instruct you in the proper methods and care products for regular care of your granite between professional cleanings. Once your granite floors, granite countertops, granite walls, and other granite surfaces are restored and cleaned, we highly recommend sealing your granite to enhance its stain resistance. Granite may be a hard stone, but it is still quite porous. Left unsealed, there’s always a risk that it will absorb spilled or splattered staining agents, discoloring your beautiful stone. These stains can generally be removed, but granite stain removal can be time consuming, expensive and often frustrating. Sealing your granite surfaces is an inexpensive way to help prevent staining damage. 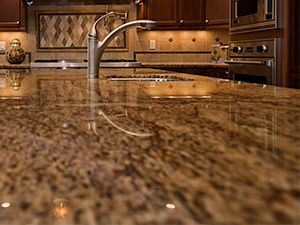 Our professional technicians are experts in removing discolorations and stains on granite. Whether you want guidance in do-it-yourself granite stain removal or prefer to have us remove your granite discolorations for you, the original color of your granite can most likely be restored. Before you decide to replace your chipped, cracked or otherwise damaged granite, consider having us provide expert granite repair services. We can fill holes, and fix granite cracks and chips, blend the repair site with the area around it, then hone and polish your granite floor, countertop or other granite surface to create a uniform finish. Although it is rare for granite surfaces to be damaged beyond repair, sometimes tile replacement is necessary. Our expert craftsman can, in many cases, remove your affected tile without damaging neighboring granite tiles, install the replacement tile, level it with the surrounding area, and then match the overall finish as closely as possible. We provide regularly scheduled maintenance services so your granite floors and other granite surfaces can look great all the time. For a FREE estimate on granite countertop cleaning and sealing, granite countertop repair and restoration, and granite floor honing and polishing services throughout Kern County and the Bakersfield, CA area contact us online or call (661) 833-1168 today.